of an A4 piece of paper to the other, and an ammonite shell as seen in the link. Am I the first to notice this??? I've heard of this golden ratio, its all voer the human body isn't it? But that's so clever, I can't belive you spotted it, I always thought it was vaugely abstract and something to distract the audience if the talking was too much to handle. You're the first person to draw attention to it, as far as I know. There was a prize which we were going to give to whoever was first, but we got fed up waiting and drank it. 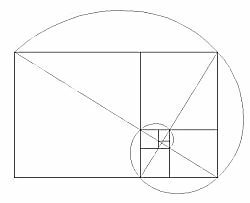 This is probably going to sound rediculously picky, pedantic and nerdy, but the ratio of the length to width of a sheet of A4 paper is not the "golden ratio" but the square root of 2. That's what comes from working in an office for 8 hours a day. Oh yes. In fact, you told us this before: post 18693. It must feel like talking to a brick wall, sometimes. I didn't mention the Golden Spiral because I thought it obvious. (some of the circles are unneccessary if you have a straight edge). Φ = (√5+1) / 2 to be exact. We researched it in second year, so I reckon I beat Jenny to finding it. Is there any significance of the diagonal line drawn through the QI screens (and desks)? As far as I know, feynman, that's absolutely true. Delighted to know that the designer's wonderful (if subtle) idea didn't go for nothing!